Takeaway: A mixture of calcium silicate and expanded perlite forms a corrosion-inhibiting layer that may be more effective than hydrophobic coatings. Doug Fast is affiliated with Johns Manville and can be contacted using the options on the right. For info on how we work with industry partners click here. Check out JM's informative website to learn more on CUI! The worldwide corrosion authority, NACE International, initiated a study in 2001 with the U.S. Federal Highway Administration to ascertain the annual direct cost of corrosion for all industries in the United States. The study estimated that the direct cost was $276 billion in 2001(1). Although there have been few follow-up studies since then, corrosion experts have good reason to believe that the direct cost has increased since the original study. Corrosion remains one of the largest expenses facing U.S. companies and public infrastructure, exceeded only by massive industries like healthcare (2). The direct cost refers only to expenses that are directly related to avoiding corrosion or rectifying damage caused by corrosion. These include expenses such as designing systems for corrosion management (e.g., material selection, corrosion allowance, corrosion protection, equipment, labor and overhead) and implementing corrosion control after the building or infrastructure has been constructed (e.g., inspection, maintenance, repairs, replacements and downtime losses) (2). (See how Corrosion Knowledge Management: An Essential Tool for Assets Integrity Management can help reduce the cost and consequences of corrosion problems.) The 2001 study categorized the $137.9 billion direct cost of corrosion by industry sector as shown in Figure 1. Note that the indirect costs are unaccounted for in Figure 1. Quantifying these costs is challenging because they include the follow-on consequential expenses that result from corrosion. For example, if an underground natural gas pipeline in a neighborhood fails due to corrosion, not only does the pipeline need to be repaired, but the homes and businesses in the neighborhood could be without natural gas-powered utilities for several days, a gas leak could cause substantial damage if ignited (not to mention the damage to the company’s reputation) and local residents in the area could have adverse health consequences after being exposed to the natural gas. All of these situations have a unique expense and are considered an indirect cost of corrosion. NACE estimated that the indirect costs are at least equal to the direct costs, and when added together they assessed the total cost of corrosion in the U.S. in 2001 to be $552 billion (1). The figures the NACE report produced in 2001 have only grown since then. More recent estimates reported in 2016 put the total cost for all corrosion in the entire U.S into the trillions of dollars (2). The figures for the industrial sector alone are still distressingly high. The 2001 report attributed $6.9 billion in corrosion costs to the electrical utility sector alone. In 2016, industry leaders estimate that 40-60% of pipe maintenance costs are a result of CUI, and 10% of the entire maintenance budget is dedicated to repairing damage from CUI (3). While some of the cost increases are attributable to basic economic inflation, many existing structures are built from aging building materials that have outlasted their intended lifespan. These materials require additional attention (e.g., more frequent inspection and maintenance), and often must be proactively replaced to avoid creating a hazardous environment. An example of this was a 2008 pipe failure at a Dow Chemical plant. Although the facility had an excellent track record of inspection, maintenance and safety standards, the high-pressure pipe system was constructed from aging materials. Their inspection failed to identify corrosion on a 30-year-old pipe. When the pipe failed, it exploded with such force that it buckled in two separate places. Fortunately the buckling happened to seal the pipe, preventing further damage until the system could be shut down and averting what could have been a disastrous situation for the plant (4). As the industry evolves to combat situations like this, NACE’s recommendation to take every step necessary to prevent corrosion before it happens is still relevant. This has led to best practices being implemented, such as correctly detailing a jacketing system and properly sealing joints. Given that fact, selecting the proper insulation is important to preventing corrosion. While some suggest that using hydrophobic coatings on the pipe or a hydrophobic treatment on the insulation is the best way to prevent CUI, there is a major drawback to hydrophobic coatings. At operating temperatures above 450°F (232°C), the hydrophobic coating will gradually burn off the pipe or the insulation, leaving the system susceptible to water invasion and subsequent corrosion. Since we can’t rely exclusively on the jacketing system or hydrophobic coatings to prevent corrosion, we should have another plan in place for when a corrosive liquid does penetrate the system. A mixture of calcium silicate and expanded perlite forms a corrosion-inhibiting layer that is very effective even if the jacketing fails and the hydrophobic-coating burns off. This calcium silicate and expanded perlite layer, which lasts for the life of the insulation and won’t burn off, is activated when water is present. It provides protection in two ways. First, when water invades the system, corrosive anions are neutralized by a pH buffering aspect of the insulation’s chemical makeup. Secondly, the insulation combines with water to create a non-corrosive coating that travels to the pipe’s surface where it hardens into a passivation layer that prevents water from contacting the pipe. While corrosion prevention may seem expensive, it is only a fraction of the indirect costs of dealing with a pipe or infrastructure failure. 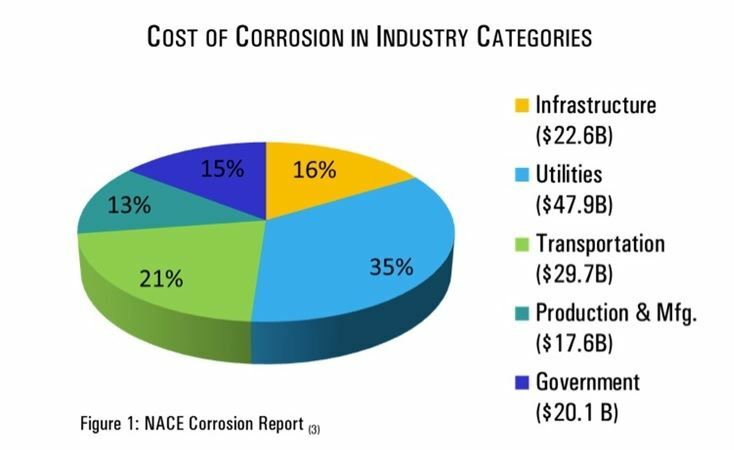 For additional information regarding the cost of corrosion and the cost of corrosion by industry sector, we strongly encourage you to read through NACE’s paper, Corrosion Costs and Preventive Strategies in the United States. Although dated, industry experts agree that the total costs have only increased and the best practices discussed in the paper still apply today.